Another day, another warm and familiar face lost to time: Patrick Macnee, John Steed in "The Avengers" television series, passed away today at the age of 93 . Patrick Macnee, famous for his role on "The Avengers" British TV series, died Thursday of natural causes at his home in Rancho Mirage, Calif. He was 93. 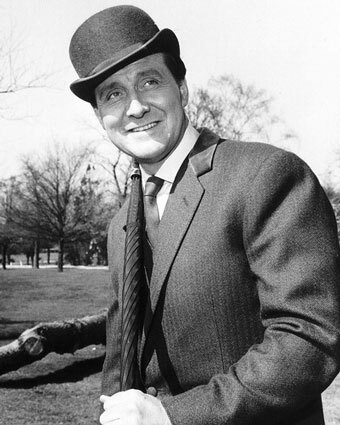 Macnee, who played John Steed in the spy-fi show, died with his family at his bedside. "Wherever he went, he left behind a trove of memories," a statement on the actor’s website read. "Patrick Macnee was a popular figure in the television industry. He was at home wherever in the world he found himself. He had a knack for making friends, and keeping them." "A successful cover almost becomes second nature." I'll always treasure his performance as Sir Godfrey Tibbett in the Roger Moore James Bond outing A View to a Kill. His easy chemistry with Moore made their scenes a highlight of the film as Moore and Macnee went undercover as an upper-crust British horse racing enthusiast and his loyal servant. This was his third time paired with Moore as Macnee played Dr. Watson to Moore's Sherlock Holmes in the television movie "Sherlock Holmes in New York" in 1976 and they appeared as part of the allstar cast in The Sea Wolves in 1981. Macnee also played Watson to Sir Christopher Lee's Sherlock Holmes in two 1980s tele-movies. When I was a kid, Patrick Macnee was one of the faces and voices of modern Great Britain (just as, to me, Peter Cushing and Christopher Lee were the image of Britain's Victorian past) due to starring in "The Avengers," an import that landed on ABC's prime time schedule and which I saw in reruns throughout the 70s. He was all over American TV in the 70s and 80s, appearing in everything from "Columbo" to "The Virginian" to "Frasier," plus showed a flair for comedy in the feature films This is Spinal Tap and The Howling.